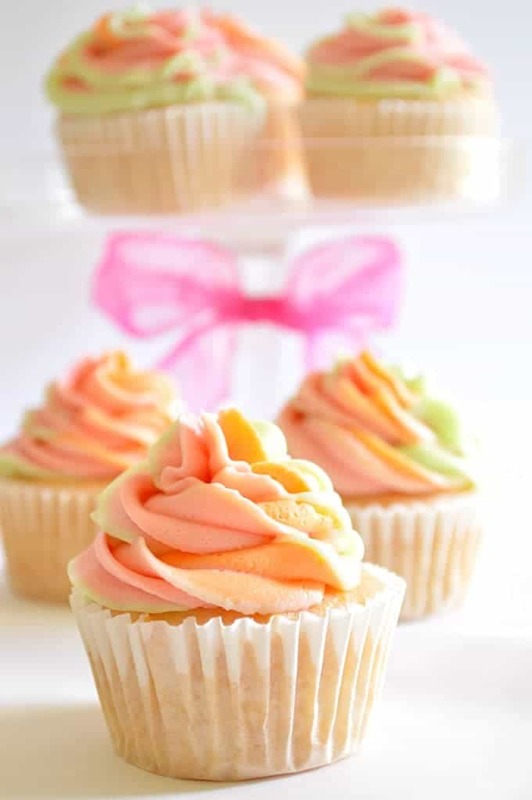 Rainbow Sherbet Cupcakes! 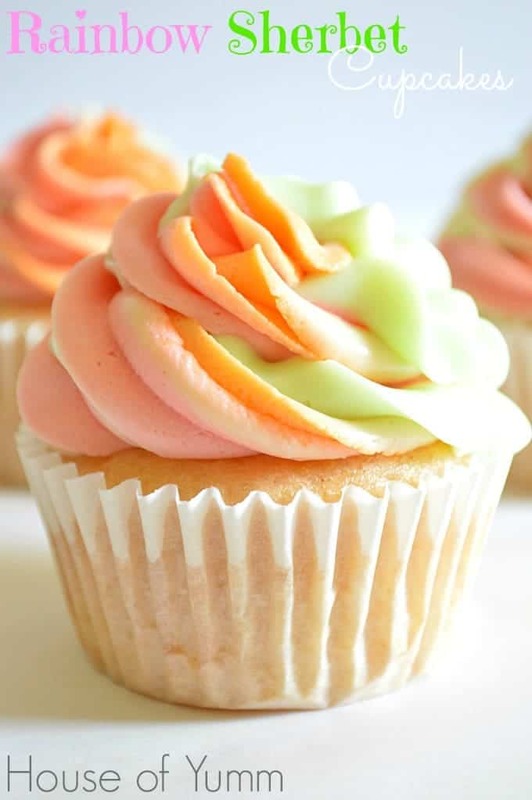 Made with real Rainbow Sherbet and topped with three flavors of frosting swirled together. 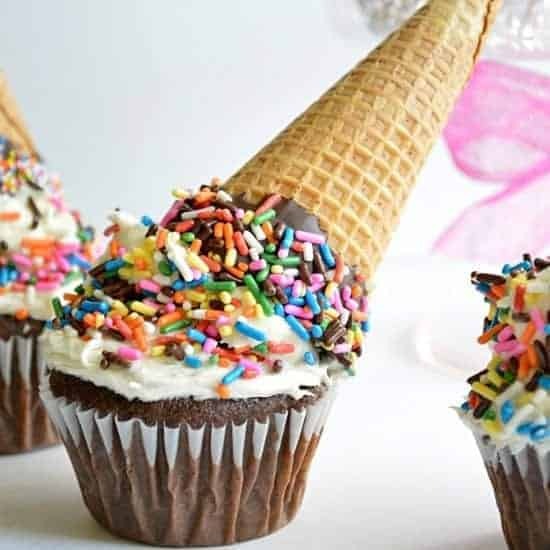 These cupcakes smell and taste like a dream! I used a Strawberry flavor, an Orange Creamsicle flavor, and a Key Lime flavored frosting. All swirled together. Trust me. It’s amazing. Make sure you check out my tutorial on how to swirl together three different frostings here. It’s so much easier than you would think! 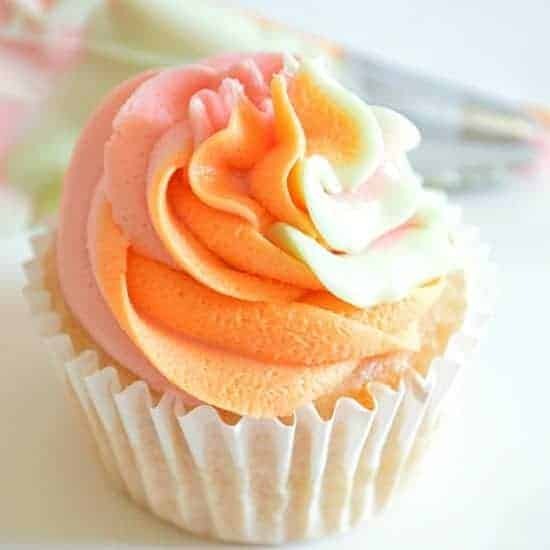 These Rainbow Sherbet cupcakes are made with real rainbow sherbet and topped with a tri-flavored swirl of frosting! Mix on low speed for 2-3 minutes until ingredients are combined. Then mix on medium speed for an additional 3 minutes until frosting is peaking, meaning that it is holding it’s shape. Frost swirling all three frosting (tutorial available). I used a Wilton 2D tip for these cupcakes. 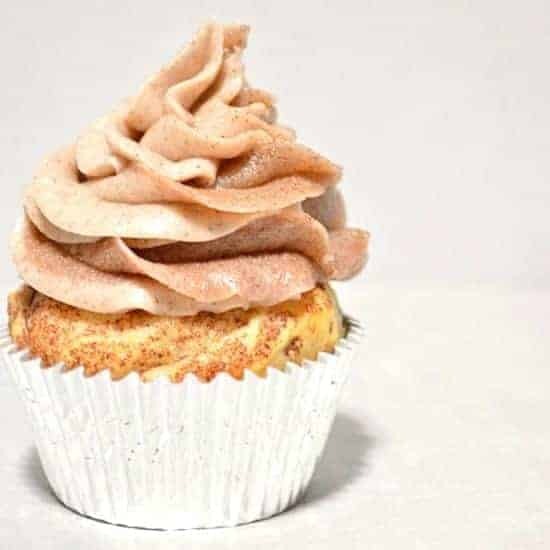 Make sure you find out how to swirl the frosting! Wow Serene! I love these and the real sherbet in it! Another beautiful cupcake! Love how festive these cupcakes are. They would be adorable for a girl’s birthday party. 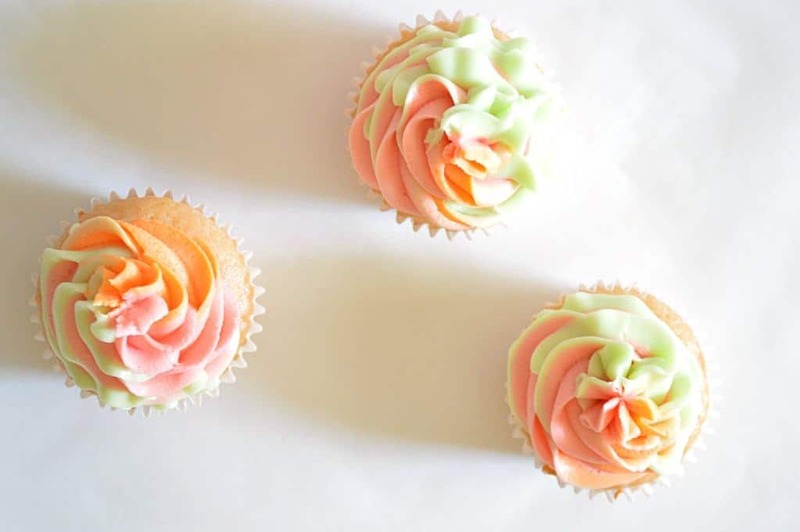 These are the prettiest cupcakes, Serene! I love that you added sherbet to the cake mix and the tri-flavored frosting is such an amazing idea!!! 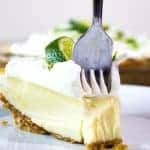 Key lime, creamsicle and strawberry sound phenomenal together! I… Am… Speechless. Utterly… Speechless………….. Okay, caught my words. LOL! These look so delicious, it’s NOT even funny. And let me tell you, EVERYTHING makes me laugh! LOL! Thanks so much Gigi! Thanks so much for the sweet comment xox. 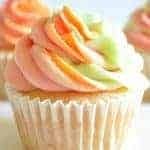 I just pinned this, I cant wait to try these cupcakes they look so yummy! 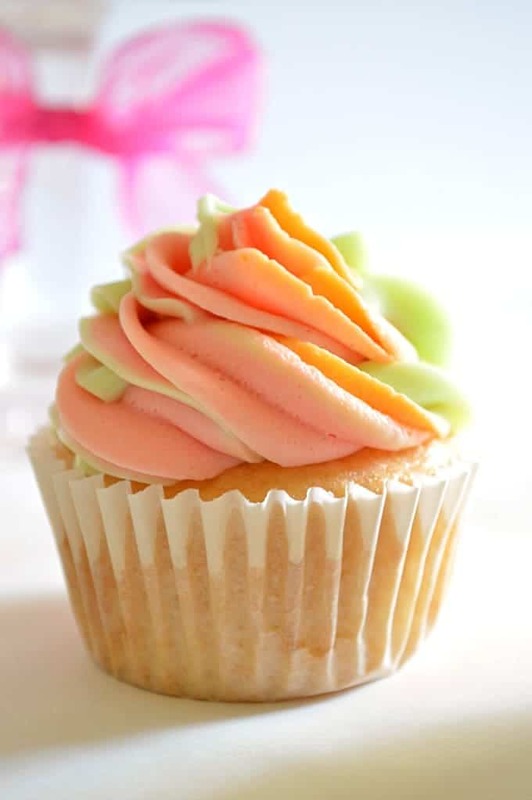 Such pretty pastel cupcakes! The next time I do a round-up of cupcake ideas I would love to feature these! I have never seen any cake or cupcakes anything like these. Pretty and fresh are words that come to mind just looking at them! Those flavor packets are really offering a way to mix things up, aren’t they? Thank you so much Chloe! I would love if you featured them 🙂 these are one of my favorite cupcakes I have made yet! Those flavor packets are definitely a winner! And if you can’t find the frosting packets, Pillsbury does have those flavors in pre-made frosting right now too! Is that 2 cups of sherbet before or after melting? Hi! Do you think I could make icing with the melted ice cream as well? Just figured i have extra so why not ise it. 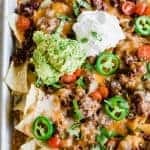 Making these this weekend, so excited! 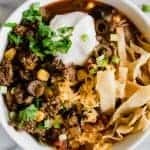 Just follow the recipe as I have it. I used the cake mix as a base and altered it to get the right consistency while using the melted sherbet. I typically use a Pillsbury White Cake Mix. Hello, I think I have hit a bit of a language barrier… when I hear the word “sherbert”, I think ‘fizzy, sour/tangy, powdered or granulated sugar treat’. Somehow, I don’t think that is what you mean. Am I right? They no longer make the Duncan hines flavor creations. 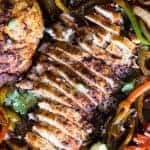 What would you suggest for a substitute? Hi Christine! I know!! You can’t get those little packets anymore. But no worries you can still make this frosting! There’s a few options, you can get extracts and use the extracts and a little food coloring. 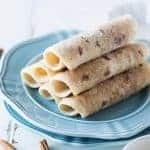 There are times that Pillsbury will make these flavors, usually during the summer, and you can use store bought frosting. 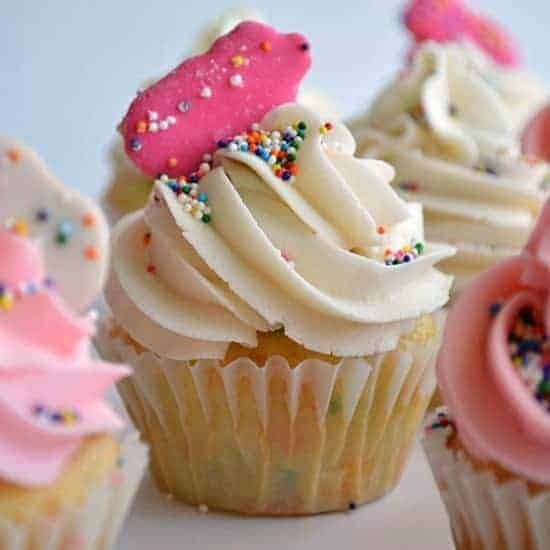 You can also try using koolaid packets or jello packets, which give amazing flavor for frosting. The only thing I have noticed with doing that in the past is that there is a little gritty texture to the frosting when you use Jello flavors. But using the extracts I think would be the best way to go!